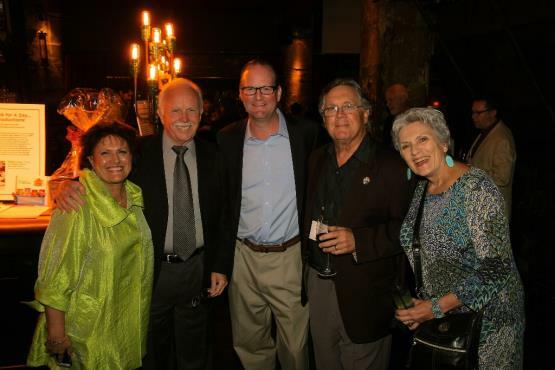 ABOVE: (From left to right) Gloria & Bob Wilson, Eric Gowey, and David & Alice Price gather at The Edison to celebrate Ryman Arts and its impact on young teens. Los Angeles, CA, USA – Local leaders in the creative industry gathered on Sunday to recognize and support Ryman Arts, a non-profit organization that fosters the artistic talent of teens throughout Southern California at absolutely no cost to students or their families. More than 250 guests assembled for the “Power Up” celebration at The Edison in downtown Los Angeles to celebrate Ryman Arts’ rich history and continued impact on young artists. The organization is currently providing arts education to 600 students annually. Ryman Arts Alumni Francisco Palomares live painting on stage at The Edison at Ryman Arts’ annual “Power Up” event. Brigham explains that the program’s comprehensive approach in identifying and launching young talent and track record over a quarter century, are the primary reasons that the organization continues to receive such tremendous support from the local creative community including Ryman Arts Board President Wayne Hunt, and Barbara Jacobs and Jeff Ganter, co-chairs of the event. “These business leaders truly understand the infinite need that our program meets in the community and the impact it has on shaping the lives of young teens,” says Brigham, who also notes that more than 80 percent of Ryman’s students come from underserved communities where there is little to no access to quality arts education. Ryman Arts’ annual event was hosted by The Edison and sponsored by industry leaders The Walt Disney Co., Garner Holt Productions, The Hettema Group, Partners Federal Credit Union, Acomb Ostendorf & Associates, AECOM, ReThink Leisure & Entertainment, Thinkwell, and Caruso Affiliated, along with Artem Golestian, Kathy Mangum, Tania Norris, Shirley and Walter Wang, Michelle Lund, and Shirley and Albert Schmidt. Media sponsors for the event include Los Angeles magazine and InPark Magazine. Executive Director of Ryman Arts Diane Brigham and Ryman Arts Board President Wayne Hunt at the organization’s annual event at The Edison in downtown Los Angeles. “Thanks to the ongoing support of these organizations and the local community, we are able to continue our work in bridging the gap in arts education. Our program helps to train tomorrow’s artists, architects, designers, and innovators, all through high quality professional art training for teens that might have not been afforded the opportunity otherwise,” Brigham adds. Ryman Arts currently hosts 40 classes a year at two locations, on the campus of California State University Fullerton in Orange County and Otis College of Art and Design in Los Angeles. Since its doors opened in 1990, Ryman Arts has engaged over 6,000 Southern California teens in its core 18-month studio program. This vibrant community of culturally diverse teens comes from over 150 neighborhoods across the region. In over two decades, Ryman Arts has evolved into a national model for transforming the lives and futures of young artists. A non-profit organization, Ryman Arts is funded by individuals, foundations, corporate supporters, and government agencies including the National Endowment for the Arts. For more information, please visit www.rymanarts.org or call 213-629-2787.